You are entitled to at least 1 rest day in every period of 7 days, statutory holidays and paid annual leave. Employers cannot compel you to work during your rest day and holidays or make any form of payment to you in lieu of granting statutory holiday. Your wages should be paid in full according to the amount specified in your contract (which should not be less than the prevailing Minimum Allowable Wage when the contract was signed), and not later than 7 days after the end of the wage period. You will be provided with free food, or at the choice of your employer, food allowance in lieu during the employment period. You must work and reside in your employer’s residence as specified in the contract during the whole employment period. Your employer has to provide free accommodation with reasonable privacy to you. Your employer will provide you the air ticket for travelling from your place of domicile to Hong Kong before commencement of the contract; and upon completion/termination of the contract, you will be provided with the return passage to your place of domicile. You will be provided with free medical treatment during your employment in Hong Kong, regardless of whether the sickness is arising from/during your performance of your duties. 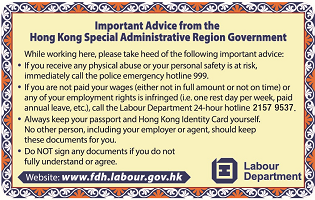 It is not a requirement by the Hong Kong Special Administrative Region Government that foreign domestic helpers have to obtain employment from employment agencies (EAs). Yet, your respective government(s) may have such requirements. Please consult your government’s Consulate representatives in Hong Kong if you have any questions. According to the law, anyone who wishes to provide job-placement services must obtain a licence from the Labour Department. You should check if the EA possesses a valid licence before using its service. You can check it online by clicking here (Chinese / English only). Your EA is prohibited to charge you any fees or expenses, be it directly or indirectly, in relation to the job-placement other than the prescribed commission (which is currently set at 10% of your first-month salary after successful placement). To protect yourselves, you should obtain a receipt from the EAs after you have paid the commission. If you suspect yourself being overcharged by an EA, you should report to EAA as soon as possible. Before engaging an EA, employers and job-seekers are encouraged to refer to the Code of Practice for Employment Agencies to understand their rights and obligations. No one (including your employer or agency) can compel you to surrender your personal identification documents (e.g. Hong Kong identity card, passport etc. ), properties (e.g. Bank’s ATM card) or publications/documents about your rights etc. You should not sign any document or contract, which you do not understand its content or do not agree with. Your EA should not ask you to take up loans for repaying agency fees or training fees. You should not agree to requests by your employer or EA to provide any false information (e.g. your wages, your employment address) in your contract. You may be liable for an offence for doing so. If you are physically abused, you should call the Police at “999”. Visit our Labour Relations Division office for free consultation and conciliation service. For assistance on sexual violence, domestic violence and/or other family crises, please call the 24-hour hotline of the CEASE Crisis Centre of the Tung Wah Group of Hospitals at 18281. Please click here for more information. For assistance on unplanned pregnancy, please call the Social Welfare Department Hotline at 2343 2255. Please click here for more information. Interpretation service will be arranged free of charge where necessary to ensure that your access to our service will not be hampered owing to language barriers. If you so wish, you can also bring in your own interpreters when you seek for free conciliation service or file a complaint to the Labour Department.